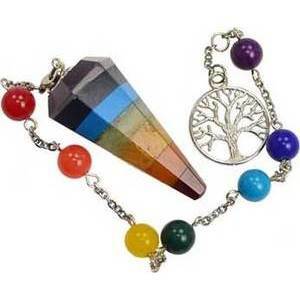 Each of these Pendulum Bracelets is a powerful and multi-use magical tool. Each can serve its owner in several ways. As a length of 7 prayer beads for meditative, ritual or spell use. As a power bracelet using the natural energies of the stones each is created from to enhance or encourage the wearer's own energies. Unique to these bracelets they may also be used as a pendulum for various dowsing and divinatory tasks. These bracelets are meant to be wearable tools and the pendulum bob may be removed, left on or reattached at the owner's discretion. 3/4" Tree of Life. 9 stone beads 5/16". Bobs are natural and will vary slightly from the average 1 5/8" x 3/4". Made in USA. Pewter, Semi-Precious Stones. As a pendulum 11" As a bracelet 8 1/2"